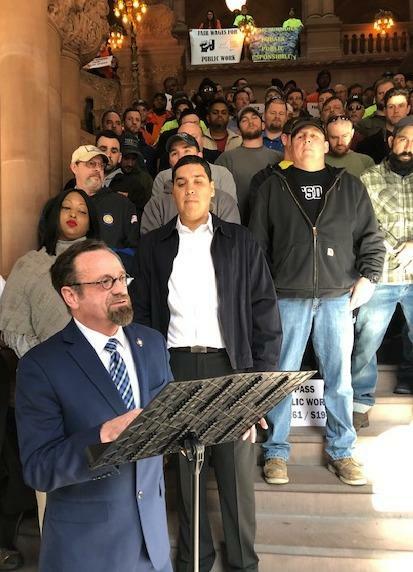 Assemblyman Harry Bronson D- Rochester, with construction workers who back a measure to extend the state's prevailing wage rules to public-private funded projects. Assemblyman Harry Bronson, a Democrat from Rochester, is the sponsor of a bill to extend prevailing wage rules to projects that draw from private and public government funds. He was joined by around 200 construction workers who stood on the Capitol’s ornate million dollar staircase between the Senate and Assembly chambers. The workers say the change would add significantly to their pay. “We’re going to fight like hell, between now and the end of next weekend, to make sure this is in the budget, ” Bronson said. 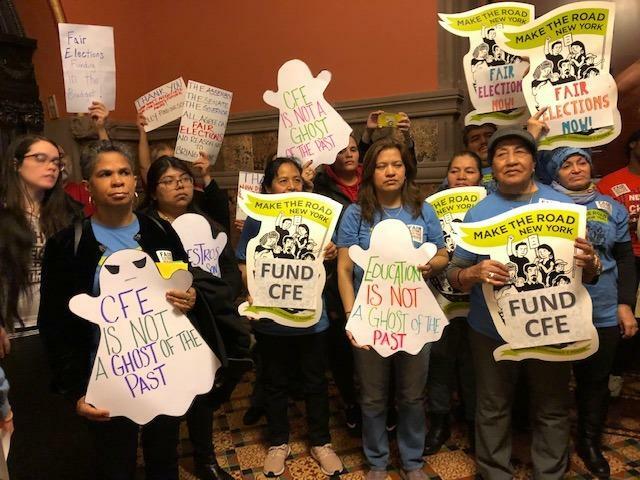 On the other side of the Senate chambers were proponents of public campaign financing, additional taxes on the richest New Yorkers and more spending on the state’s poorest schools. Janine Harper, is the head of the PTA at PS 770 in Brooklyn . She says her school is owed half a million dollars in funding under a 12-year-old court order known as the Campaign for Fiscal Equity that she says remains unfilled to this day . Governor Cuomo, who has proposed spending an additional one billion dollars more on schools in the new budget, has said its time to move on from the court case. The legislature wants to fulfill the court order in a three year phase in, and recommends spending $600 million more on schools above the governor’s number. Others are pressing to keep some measures out of the budget, including a tax proposed by Governor Andrew Cuomo on opioid prescriptions. Opponents include the chair of the Assembly Health Committee, and the legislature’s only pharmacist, John McDonald, of Cohoes. He says it’s “terrible” public policy. “There are plenty of fingers to point,” McDonald said. “But at the end of the day, pharmacies are not the villain, and patients certainly are not the villain in this situation." McDonald and the others say the latest version of the bill, which was first proposed by Cuomo last year, is badly flawed. The 2018 bill would have prohibited drug companies from passing the costs on to patients. But that provision was struck down in federal court as unconstitutional. The new version does not prevent manufacturers from raising prices to patients. Julie Farrar, who has chronic pain from a spinal condition, worries that her medical bills might go up if the tax is approved. “It is going to trickle down in a way to hurt the people that use opioids effectively to manage, for myself, chronic severe pain,” Farrar said. The tax would bring in $100 million to the state’s general fund. Assemblyman McDonald says the money could instead be gained from savings in the state’s vast Medicaid program. 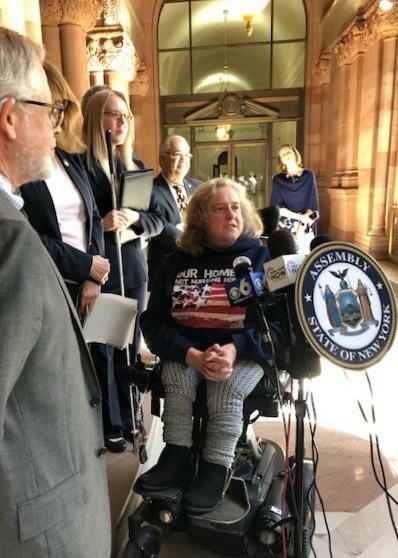 The biggest group of the day included several hundred developmentally disabled New Yorkers, and their health aids, asking for a cost of living pay increase for the direct care workers. Governor Cuomo took the funding out of his budget this year. Senate Mental Health Committee Chair David Carlucci, who addressed the crowd, says the Senate proposes restoring it. Later, the governor’s counsel, Alphonso David, said the funding of $75 million will be restored. “The governor has made a decision that he will not pass a budget without increasing the wages to direct care workers,” David said, to cheers. Perhaps the biggest voice, though when it comes to the budget is Governor Cuomo who has said repeatedly that he won’t agree to a budget without a provision to make the state’s temporary two percent per year property tax cap permanent. The governor held a rally on Long Island over the weekend, where property taxes are among the highest in the nation. “I have said that this hand will not sign a budget that does not have a permanent tax cap, period,” Cuomo said on March 24. The governor is also calling for criminal justice reforms , including an end to cash bail, to be part of the state budget, and a congestion pricing plan for parts of Manhattan to help fund public transit. The new state budget, due April 1, will be first one decided by an all-Democratic state legislature in a decade, after Republicans ruled the Senate for most of the past century. And while the leadership of the Senate and Assembly have been newly reasserting their governing powers when it comes to the spending plan, there’s only so far that they can go in their disagreements with Governor Andrew Cuomo. Gambling casino companies are pressing Governor Andrew Cuomo and the legislature to allow them to open gaming centers in New York City as part of the new state budget. There are a number of obstacles to overcome, but the proposal may seem tempting to lawmakers, who are strapped for cash this year.